Was it rust or ricers that brought so many 1980s Corollas to their unfortunate demise here in Indiana? These cars were certainly hardy enough to endure, yet they disappeared from our roads at least 10 years ago. Except, obviously, this one. 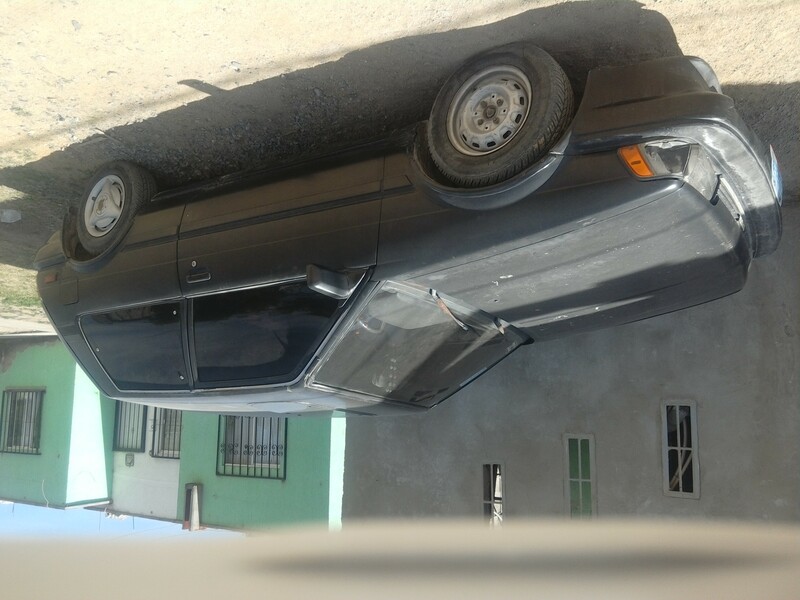 Among late-80s Corollas, the four-door sedans and five-door hatches were overwhelmingly the popular choices here in Rustopia. Stubby little FXs were uncommon – so uncommon, I’d forgotten about them. It took me a minute to recognize what I was seeing when I came upon this one in the parking lot at my favorite big-box store. As I circled the car with my camera, a tiny white-haired woman rolled up in a motorized shopping cart. “Are you admiring my car?” she called out. “Absolutely!” I replied. “Oh, I just love my little car. I’m turning 90 this year and I’ve been driving it for 25 years,” she said. “It’s my baby! It replaced a Dodge Dart that my idiot son ruined.” As she stood and opened the hatch to load her groceries, I saw that she was well under five feet tall. I imagined her barely being able to see over the dashboard of that Dart. The FX was just her size. “I take good care of my car, and always park it in the garage,” she said. Yet the body showed some scrapes and the steering wheel was 90 degrees off center despite the front wheels pointing straight ahead. Then she said, “I put gas in it about twice a year. Last time was Valentine’s Day!” I wondered how well it ran on its eight-month-old fuel. 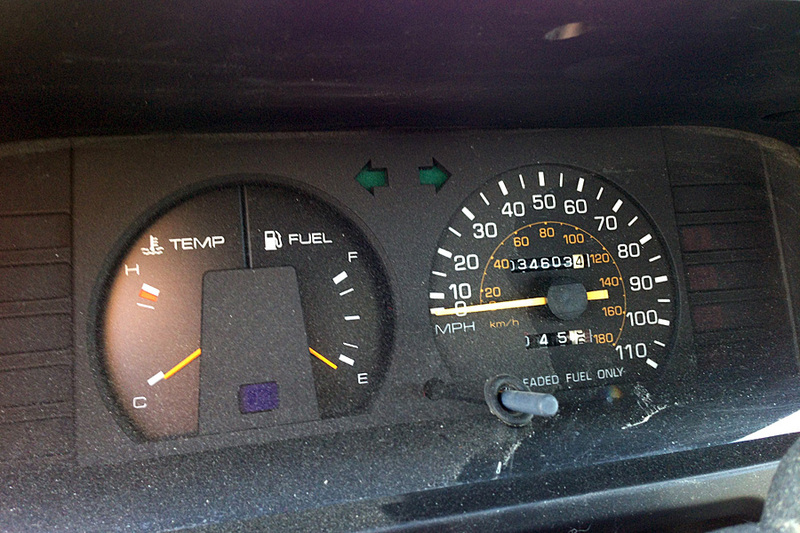 Still, at just under 35,000 miles, this Corolla isn’t even broken in yet. “I wonder what will happen to my car after I’m gone,” its owner wondered aloud. I am sure some young ricer will be thrilled to buy it, but I didn’t say that to her. I figured it would hurt her heart to know how that kid would gladly soup it up and burn it out. No, I just smiled and said that I really loved how much she obviously enjoyed her just-her-size car. 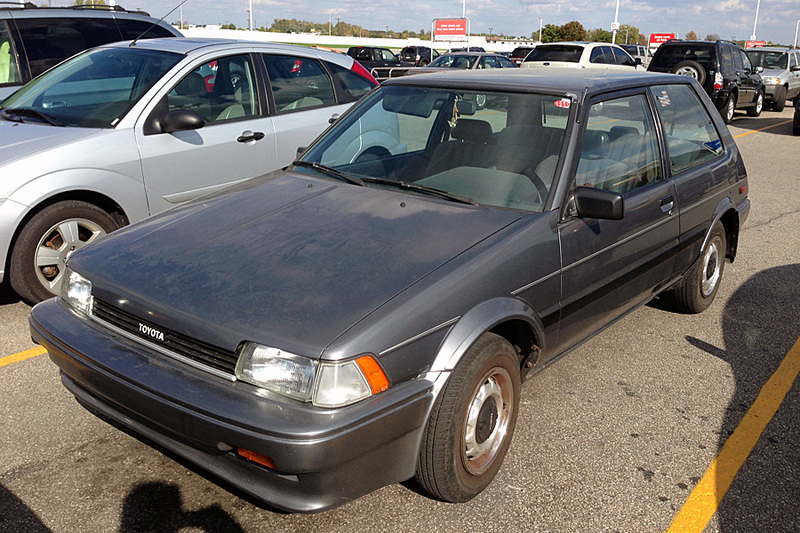 Check out a CC on the contemporary, but much peppier, Corolla FX16 here. Many years ago when my sister in England needed a “new” car , I found her one of these. Bright red with no scrapes – the only black mark was a long list of previous owners. 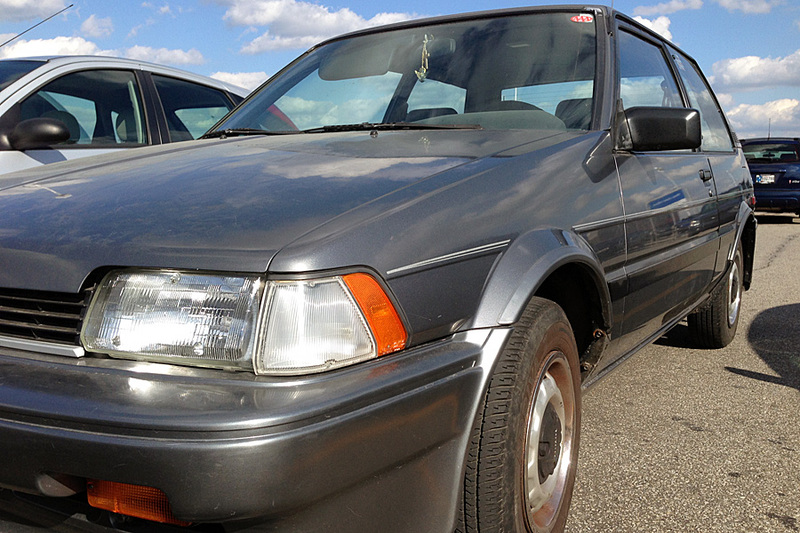 These were very rare in the UK , only the 5-door liftback variant was anything like common. It really was a lovely car to drive, and gave many years of good service for little expense. I kicked myself a little later that I didn’t give her my card. This isn’t the CC I’d pick first to own, but if this one came to me I’d certainly not turn it down. I did that once with a gold and white 1957 Belvedere sedan that I’d missed out on. That was the only time it ever worked – the guy emailed me after he had had two wrecks in the car and had run the mileage from 30k to 200k. He wanted more for the car than he had paid. I passed…. When my ex girlfriend finished university she needed a car, so we looked for a while and scored a Ford Laser that had only 36,000km on it! 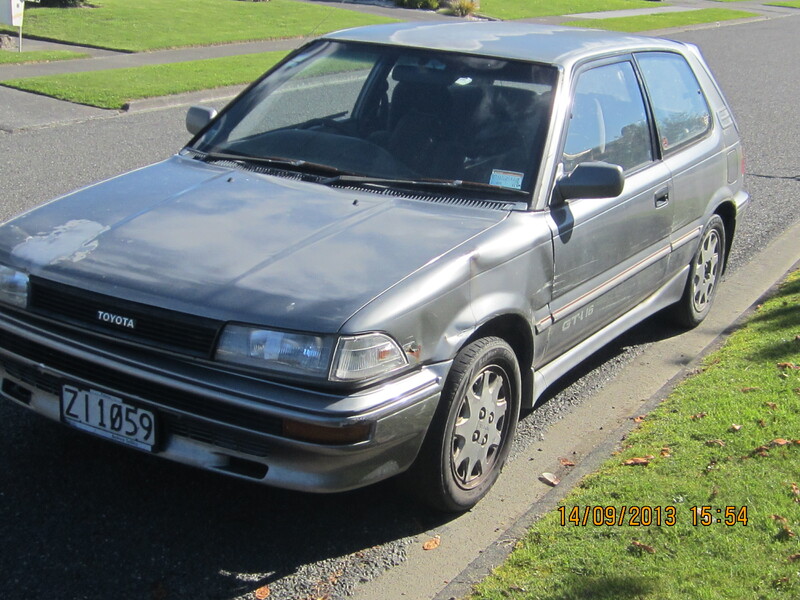 It was almost 20 years old at that point, and had one owner, man, that was a tidy little car. So good to get a car with so little use. Living in Texas means I still see these from time to time. Doubt if I’ve seen one with under 40K for a long time. The tin worm may not live here but the dent monster does. This shows the car is a daily driver and not a weekend type due to it not having the historic plates that most of these cars now have. I like the FX due to the hatch style. Great find and story. There’s a fair number of these still around here, but undoubtedly not with such low mileage. More like with 350,000 miles. My roommate just bought an 87 FX here in Eugene off Craigslist for $300 with only 165K. It was listed as undriveable with a stuck clutch. He drove it home and put a new slave cylinder on it and voila, good to go. I might wind up with it soon. Great find and an even better story, Jim. Probably never reached full operating temperature, nor ever drove faster than 50 mph. I bought a used automatic NUMMI/Toyota FX in 1995 for my wife to learn to drive. It’s an honest and unpetentious car. 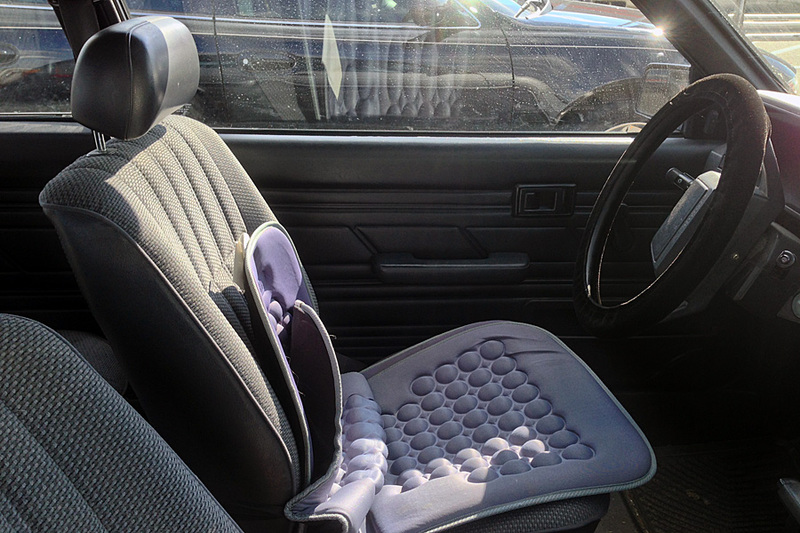 The clean design of the dashboard and the quality of the cloth seats were good. But the chopped-off rear end made me wonder “were is the rest of it?”. Nice low mileage find! The regular FX was kind of a lame car though, the FX-16 was the hot ride. Different engine, gearbox, suspension, nicer seats… changed the entire character of the car. 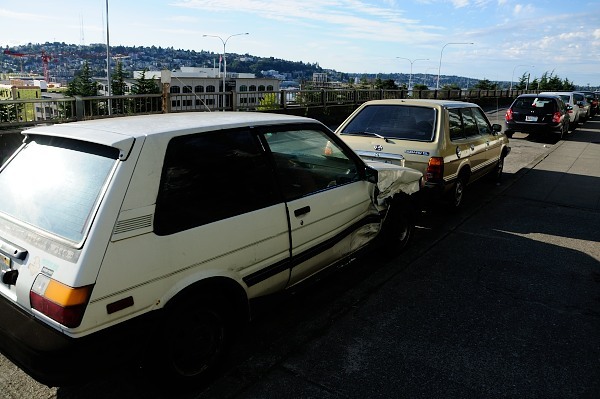 There may still be a pretty battered FX floating around my ‘hood, though I haven’t seen it in several weeks (along with an early 80’s Subaru wagon that is in much nicer shape). The ‘yota has a big, nasty ouch on the passenger side, I even got pictures of this poor thing too. This photo was taken back in September, just a couple of blocks north of my apartment. Ib just sold a five door Corolla this model with 340,000kms on it. It has since been called “Dave the red minion” as there are so many still driving in HawkesBay and FX GTs are still common here, NZ Skyliner comes from a wealthier part of Godzone where these are becoming scarce. not here bro, this one is in the next street to me. I always thought this second generation FX was better looking than the first. We never got the later ones but I’ve had a couple of the Tamiya model kits. What a touching story. 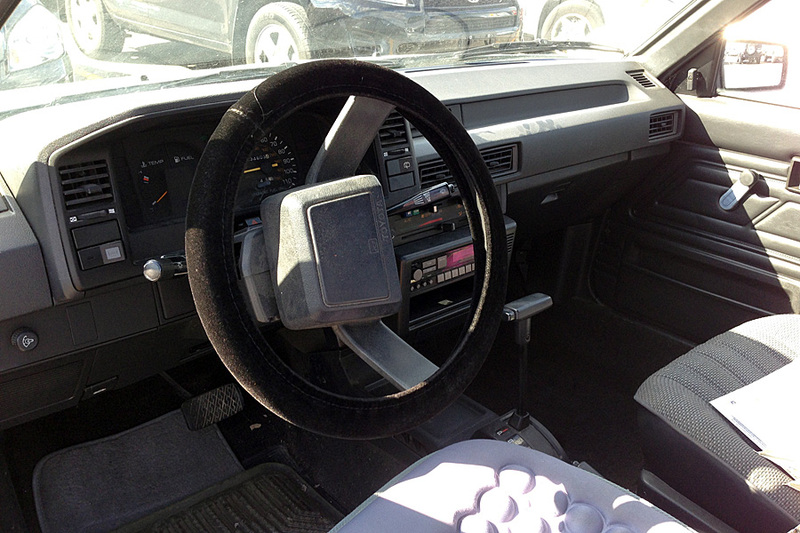 I wonder what botched repair caused the steering wheel to be 90 degrees off on such low mileage car? Take a look at the pictures the wheels are not straight ahead they are turned to the left just a bit so I bet that the steering wheel is right when going straight down the road. +1. A slow steering ratio (and/or a hard yank to lock the wheel) explains the seemingly off-center kilter. Eh? Those front wheels are only a hair off center. I don’t get why that would translate to a steering wheel at 90 degrees. I’m with the others. This probably doesn’t have power steering, and a slow enough ratio for this to be normal. A quarter turn isn’t really all that much, and it’s hard to perfectly judge the angle of the front wheels from the camera angle. Wow never seen one of these before. I think with the oversized styling on most modern cars she’d have a tough time finding an equivalent that she can easily see out of all the way around. Nice find! Given that she’s almost 90, I’m betting she’s not worrying at all about ever buying another car! 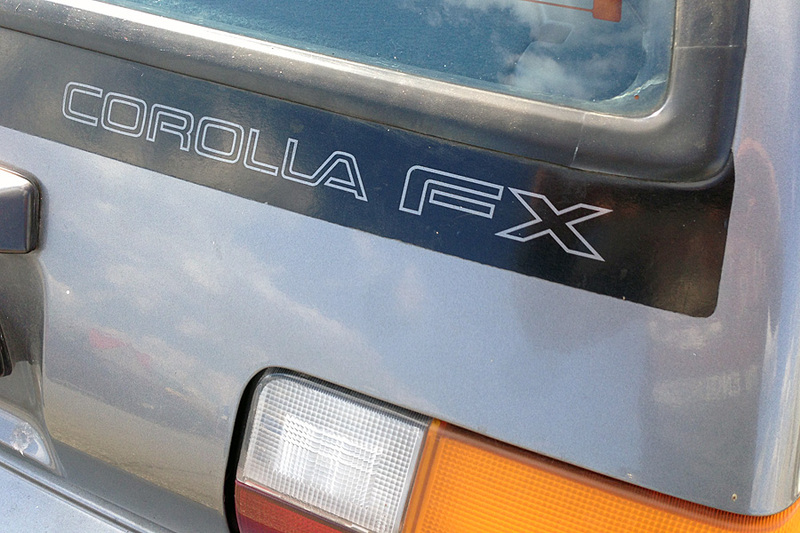 Those Toyota Corolla FX/FX16s were 2-year wonders and I believe they were built at the NUMMI plant in Fremont. 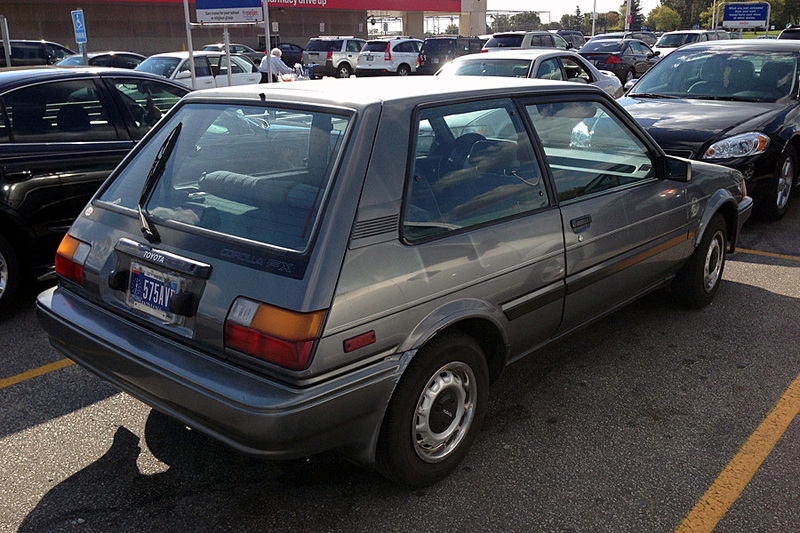 Toyota had three lines of Corollas in 87: the FX/FX16, the 4-door sedan/hatchback and the rear-drive SR5/GTS. 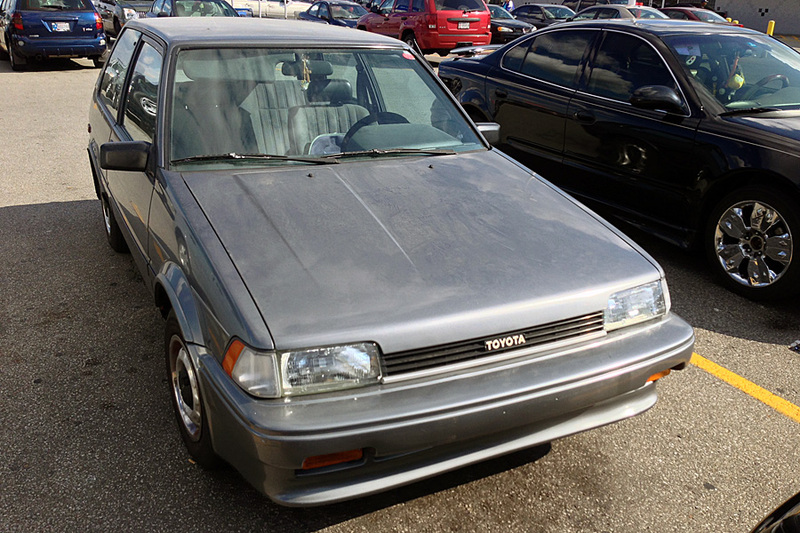 In 88, the Corolla sedans and SR5/GTS coupes were redesigned and a station wagon returned to the lineup powered by a 1.6 liter dual-cam engine with 16 valves. Surprisingly, that engine used a carburetor when it went into Corolla sedans, wagons and SR5 coupes. Nice car, the don’t build ’em like that no more! A friend of mine owned an ’87 FX 3 door. Ohio rust rendered it unsafe to drive at age 20, but it ran perfectly on the way to the junkyard. 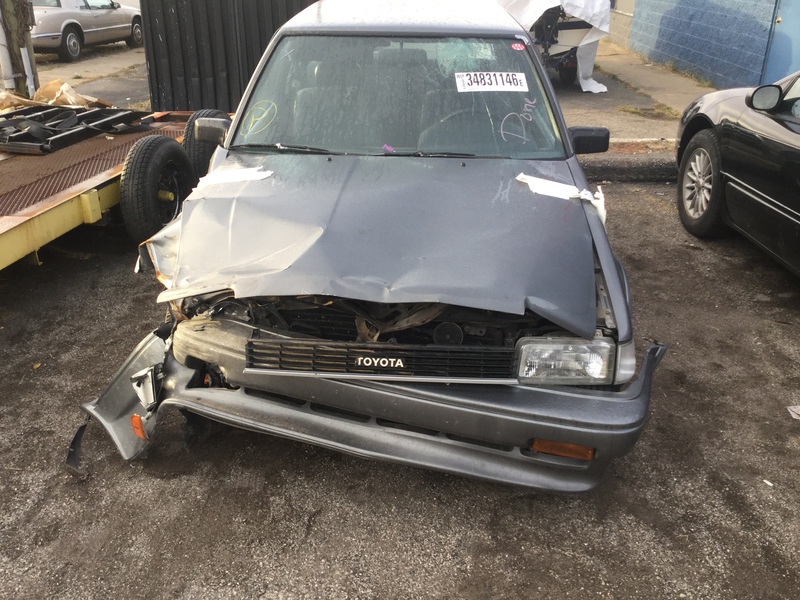 It is being restored as,we speak and I am sorry about being blunt but I showed it to a family member and they pointed out that I forgot to mention that and I made it sound like it was totaled forever… I apologize for my misendeavors on the car. I have a one of these for sale for friend. Located in Oakland ca, anyone know of someone looking to buy? Loved this story and pictures, Jim. Thanks for the writeup.